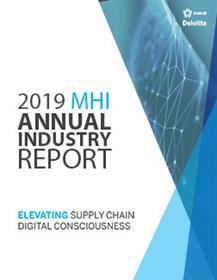 Robotics and automation are the major technological disruptors in the supply chain, according to the latest MHI Annual Industry Report. The report, released at Promat in Chicago, found that digital supply chains will be the predominant model within just five years. The survey results also suggest that investment in supply chain innovation is at a critical inflection point, with a trend of declining investment from 2015 to 2018 being more than countered by a 95% increase in projected spending for 2019. More than half of the survey respondents are planning to allocate more than USD1 million in new technology investments over the next two years - up 10% on last year’s survey. A third plan to invest more than USD5 million, while more than a fifth (22%) will spend more than USD10 million. "The pace of supply chain innovation over the six years of our survey is truly astounding, creating real and measurable competitive advantage for early adopters," says George Prest, CEO of MHI. "With supply chain complexity showing no signs of slowing, the risk of inaction is only growing. Leading manufacturing and supply chain executives agree that technology is the key to future success." Like last year, the survey suggests that a highly skilled and increasingly digital supply chain workforce is needed to implement these technologies. The findings are based on survey responses from over 1,000 manufacturing and supply chain industry leaders from a wide range of industries.